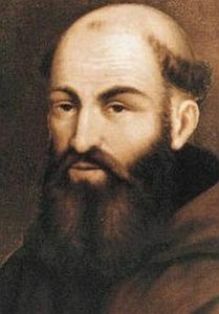 Blessed Marco was born as Carlo Domenico Cristofori on November 17, 1631 in Aviano, Italy to Marco Pasquale Cristofori and Rosa Zanoni. At the age of 16, he left home to walk to Crete where Venice was at war with the Ottoman Turks, planning to preach Christianity to Muslims and take his chance on martyrdom. After a few days, he stopped at a Capuchin house seeking food and shelter. His time at the monastery affected Carlo deeply, and in 1648 he became a Capuchin novice at Conegliano, Italy. He made his formal vows in 1649, taking the name Mark. On September 8, 1676, while preaching at a monastery in Padua, Italy, Mark prayed over Sister Vincenza Francesconi, who had been bed-ridden for 13 years; she was miraculously healed. Word spread and while he continued preaching, Mark was soon besieged by people seeking miracles; many were healed and many were brought to the faith. He worked as a peacemaker throughout Europe, bringing unity to warring Catholic powers, educating them on the threat posed by the Ottoman’s and never letting them forget that all wise counsel was given by God. On August 13, 1699, Mark died of cancer in Vienna, Austria. He was Venerated on July 6, 1991, decree of heroic virtues and Beatified on April 27, 2003 by Pope John Paul II. Lord, God, you filled Blessed Mark, your priest, with ardent desire for unity among all Christians; grant that we through his intercession, may be renewed in spirit and heart so that we can spread your love to everyone and confidently work for the unity of all Christians int he bond of peace. We ask this through our Lord Jesus Christ, your Son, who lives and reigns with you and the Holy Spirit, one God, for ever and ever.